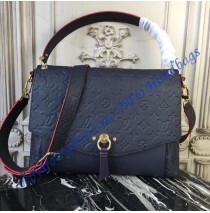 If you are on the prowl for one of the newest, most interesting Louis Vuitton handbags, then you've come to the right place. 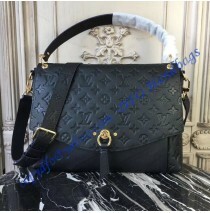 First of all, if you are looking for something refined, luxurious, and original, Louis Vuitton is the way to go. This French brand was founded in 1854, and it hasn't faltered since. They started off with simple trunks, but have in time expanded over all sorts of leather goods. Their luxurious craftsmanship guarantees durable items, while their iconic designs make LV accessories timeless. If fashion is your passion, these ready-to-wear items will be staplees of your wardrobe. 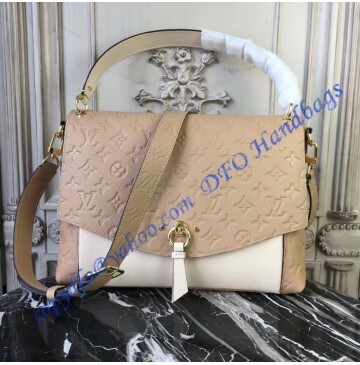 Monogram Empreinte leather is the luxorious version of Louis Vuitton’s signature material. The Blanche MM bag before you is one of the most gorgeous examples of how masterfully LV adapts it to modern design. Simple lines and a foldover monogram top of this bag, in combination with subtle gold-colored details, further emphasize its tender color. The flap closure looks amazing with Louis Vuitton’s signature hook and leather detail. Embossed and smooth cowhide combination makes this leather bag the perfect casual-chic accessory for day-to-day use. The thin handle on the top allows you to carry this bag in your hand. On the other hand, a detachable Monogram Empreinte leather strap allows you to wear it cross-body or on the shoulder. When it comes to the interior, this bag features one outer pocket, two small inner pockets, and a large main space. Curvaceous and roomy, this bag will quickly become your favorite accessory. When it comes to size, this bag falls under the medium-small category. Its width is 12.2”, height is 9.3”, and it is 4.1” deep.